Here are the recipes that we cooked up for several weeks. I increase the recipes so that we had enough for supper and lunch the next day. This recipe has been increased to provide a 1 cup portion for four people and a ½ cup portion for one person for seven days. I mix this in with the ground turkey. 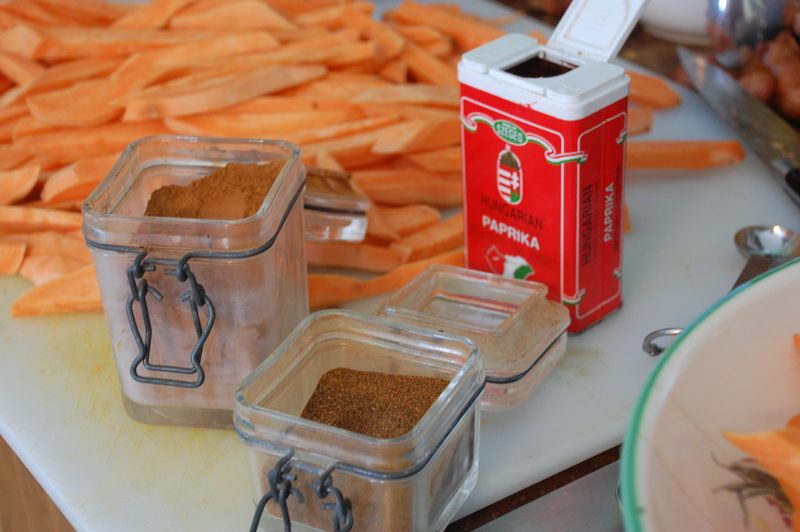 You can make it into patties or just cook it as ground sausage. We eat kale every morning. Yum, it’s so good! In a large pan add some coconut oil. Heat the pan on medium heat and add a bag of Trader Joes organic kale, or another type of organic kale. Stir it around until it begins to wilt. Put a lid on the pan. Throw about ¼ cup of water into the pan and quickly replace the lid. Let it wilt further and when the water is about evaporated sprinkle kale with olive oil and sprinkle with salt and cook until you find your desired tenderness. In addition to delicious kale, we also sweeten our breakfast with sweet potato. I have found that cooking enough sweet potato at one time to last the week works out great. I wipe the outside of the potato with a towel and place them in a preheated oven (400 degrees) and they cook for 30-45 minutes or so. I don’t wrap them in aluminum foil, their skin keeps the moisture in and there’s no need for additional wrapping. I check for doneness depending on the size of the potato and take them out as they cook. This week we made 14 boiled eggs which will get us through 7 breakfasts. 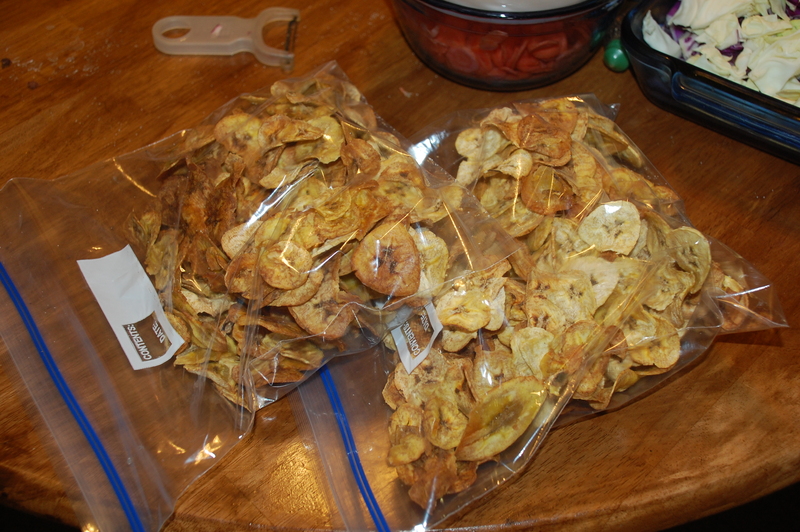 We went ahead and peeled them to save time each morning. So, this is what we did: we gently placed a single layer of eggs into a large pot and brought the water to a boil and boiled the eggs for 10 min. After 10 minutes we placed the eggs in a sink full (or bowlful) of cold water. I have seen folks add ice to the water. The point of this is to stop the cooking process which supposedly keeps the yokes bright yellow and does not allow that dark greenness on the yolk. If they are pastured eggs and they are fresh, the shell may be difficult to remove. We have yet to find a fool proof way of peeling fresh eggs. We have tried running hot water over them after they have come out of cold water. We have also tried keeping the shell on them until they are ready to use, then microwaving them which creates enough steam to lift the shell. Sometimes these methods work and sometimes they don’t. Some of the family prefer fried or scrambled eggs and so, unless it’s the weekend I cook those to order. This recipe looked good and had all intentions of buying a boneless chuck, but when I got to the store it was too darn expensive (grassfed = mucho $). So I purchased some ground beef instead and planned to mix it with ground turkey. I got home, checked the recipe and realized that the meat was to be marinated. I was on the phone with mom, and she suggested making meatballs. I did and it turned out great! The kids LOVED it. Now, I did not put as much zucchini as the recipe called for and I added peeled radishes (later I found that I did not have to peel them and they were fine). 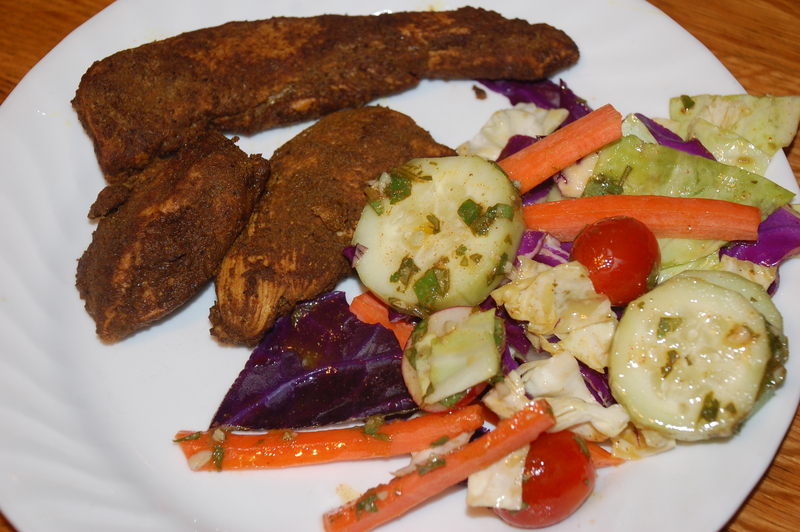 I also used apple cider vinegar instead and it turned out well, although I can imagine that the balsamic vinegar would really add a lot. This go around I made this recipe with ground turkey (to give us a different meat) and I followed the recipe completely. I got my Chinese 5 Spice from Whole Foods. McCormick sells one, but it has additives that are on the Whole 30 banned list. These are oh, so delicious. They’re crunchy, even when left uncovered. They are enormously time consuming to make, but really worth it. A food processor with a slicing blade is a MUST. We usually have a veggie and an avocado as a side in addition to plantain nachos. This recipe is so delicious and delights the entire family. 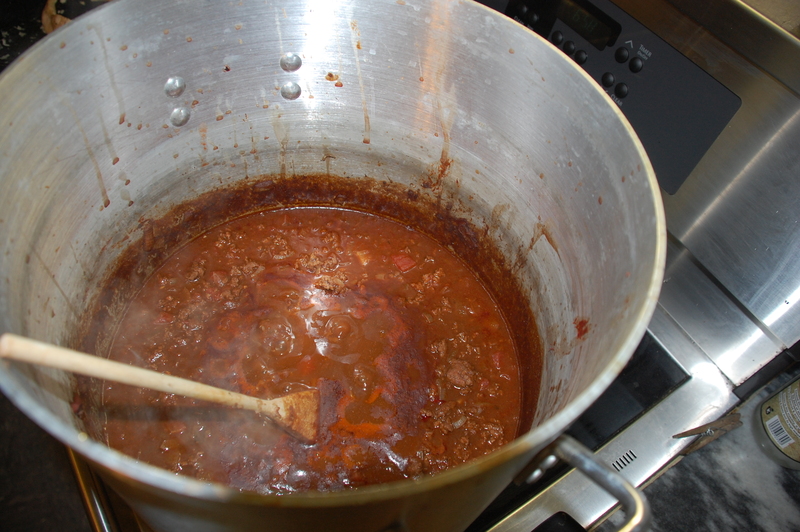 Chocolate chili on it’s 2 hour simmer…yum. Big L agrees with the title of this recipe, it’s “the best!” I have come to not cover the meat so completely in the spices, I think one can taste the flavors better this way. Now, this recipe is not available on her blog. I found it in Well Fed 2, but I see that this lady has permission to share it on her blog. This recipe calls for coconut milk and since we aren’t big fans, I added organic, virgin coconut oil instead. We’ve not tried it yet, so I’ll update here when weI do. She does not list the recipe for Jerk Seasoning, it’s in the book (which I own). You’ll have to scroll down and find the recipe for the taco meat. We don’t serve the plantain chips with the taco meat. We make soft tortillas with the taco meat! Tacos, with most of the typical sides, on DE-licious tortillas! YES, I said tortillas! So, get the meat recipe from the link above and get the tortilla recipe here. Daddy D and the kids said that these are the BEST tortillas they have EVER eaten! Perhaps it’s the fact that we have been 30 days with not a taco in sight, but I think if you try these you will want to make them every week. This recipe will make 12, 5″ tortillas. Daddy D oiled a small piece of parchment paper and used it to smooth out the batter circle. Make sure that you go by touch as the recipe states, because they will look wet when they are really dry. After they came out of the oven I “fry” them in a bit of coconut oil until they are slightly brown. This is simply a hamburger without a bun. 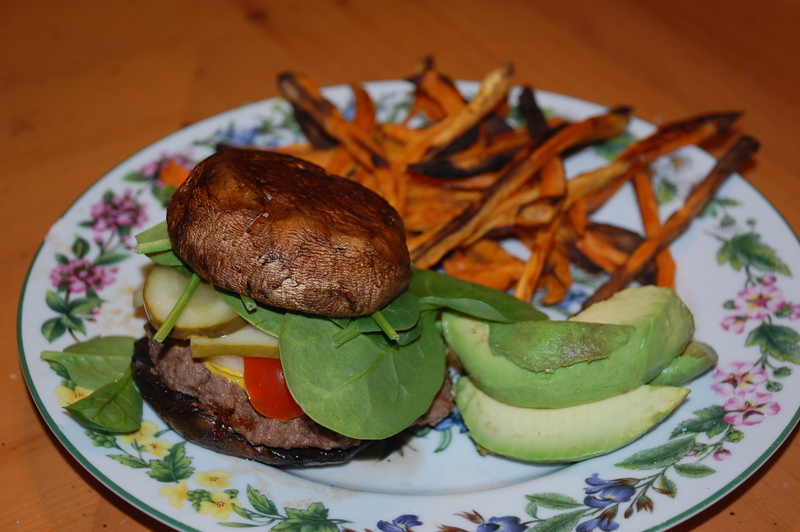 The first time that we made this, I had portabella mushrooms as buns, but they are expensive (I spent $10 for 8 at Super G) and we did not feel they were critical to a tasty burger, so next time we’ll go bun-less. I purchased 100% grass-fed ground beef and then had the following condiments – Trader Joe’s organic dill pickles, onions, organic cherry tomatoes, mustard, homemade ketchup (tomato paste, allspice, vinegar, fruit juice to sweeten, salt and pepper) and spinach.We ate them with a side of sweet potato fries. 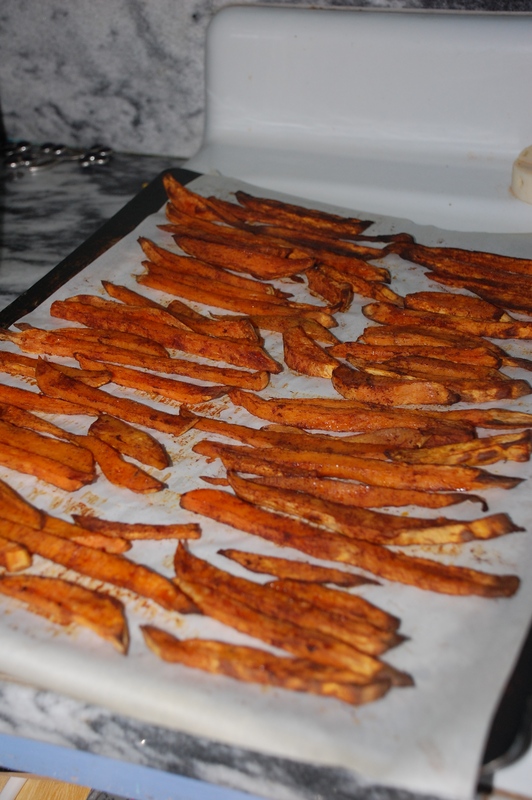 I used a sweet potato fry recipe from Nom Nom Paleo for my first sweet potato fries. Sunday Uncle M shared some fries that Aunt Ro had made and they were DE-licious! Preheat oven to 400 degrees. Peel the sweet potato (I like to peel them because there are pesticides in conventionally raised sweet potatoes). Slice the potatoes into reasonably thick fries and put the fries in a large bowl. Pour a generous amount of olive oil onto the sweet potatoes and sprinkle them with cinnamon, paprika, and chili powder and incorporate well. Lay fries in a single layer on a parchment paper lined baking sheet and bake for about 25 minutes then flip and continue to bake for 20 minutes more. That’s it folks! This is our meal plan for the week. I hope you’ll try these recipes and comment on how you prepared them or share information that you found helpful.